The word "transfiguration" comes from the Latin roots trans- ("across") and figura ("form, shape"). It thus signifies a change of form or appearance. This is what happened to Jesus in the event known as the Transfiguration: His appearance changed and became glorious. Before looking at the Transfiguration itself, it’s important that we look at what happened immediately before it in Luke’s Gospel. The Transfiguration of Jesus is an episode in the New Testament in which Jesus is transfigured and becomes radiant in glory upon a mountain. The Synoptic Gospels (Matthew 17:1–9, Mark 9:2–8, Luke 9:28–36) describe it, and 2 Peter 1:16–18 refers to it; it has also been hypothesized that the Gospel of John alludes to it in John 1:14. Peter, James, John, Jesus, Moses, and Elijah were on the mount of transfiguration. In these accounts, Jesus and three of his apostles, Peter, James and John, go to a mountain (the Mount of Transfiguration) to pray. On the mountain, Jesus begins to shine with bright rays of light. Then the prophets Moses and Elijah appear next to him and he speaks with them. Jesus is then called "Son" by a voice in the sky, assumed to be God the Father, as in the Baptism of Jesus. The Transfiguration is one of the miracles of Jesus in the Gospels. This miracle is unique among others that appear in the Canonical gospels, in that the miracle happens to Jesus himself. Thomas Aquinas considered the Transfiguration "the greatest miracle" in that it complemented baptism and showed the perfection of life in Heaven. The Transfiguration is one of the five major milestones in the gospel narrative of the life of Jesus, the others being Baptism, Crucifixion, Resurrection, and Ascension. 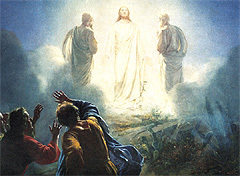 In Christian teachings, the Transfiguration is a pivotal moment, and the setting on the mountain is presented as the point where human nature meets God: the meeting place for the temporal and the eternal, with Jesus himself as the connecting point, acting as the bridge between heaven and earth. The Feast of the Transfiguration is celebrated by various Christian denominations. In the Syriac Orthodox, Indian Orthodox, Revised Julian Calendars within Eastern Orthodoxy, Roman Catholic, and Anglican churches, the Feast of the Transfiguration is observed on 6 August. 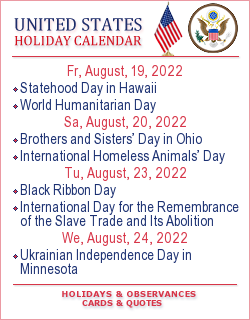 In those Orthodox churches which continue to follow the Julian Calendar, August 6 in the church calendar falls on August 19 in the civil (Gregorian) calendar. Transfiguration is considered a major feast, numbered among the twelve Great Feasts in the Byzantine rite. In all these churches, if the feast falls on a Sunday, its liturgy is not combined with the Sunday liturgy, but completely replaces it. In some liturgical calendars (e.g. the Lutheran and United Methodist) the last Sunday in the Epiphany season is also devoted to this event. In the Church of Sweden and the Evangelical Lutheran Church of Finland, however, the Feast is celebrated on the seventh Sunday after Trinity, the eighth Sunday after Pentecost. In the Roman rite, the gospel pericope of the Transfiguration is read on the second Sunday of Lent, whose liturgy emphasizes the role the Transfiguration had in comforting the Twelve Apostles, giving them a powerful proof of his divinity, and a prelude to the glory of the Resurrection on Easter and the eventual salvation of his followers in view of the seeming contradiction of his Crucifixion and death. This theme is expounded in the Preface for that day. To put it simply: the Holy Spirit bothers us. Because he moves us, he makes us walk, he pushes the Church to go forward. And we are like Peter at the Transfiguration: ’Ah, how wonderful it is to be here like this, all together!’ ... But don’t bother us. We want the Holy Spirit to doze off ... we want to domesticate the Holy Spirit. And that’s no good. because he is God, he is that wind which comes and goes and you don’t know where. He is the power of God, he is the one who gives us consolation and strength to move forward. But: to move forward! And this bothers us. It’s so much nicer to be comfortable.